When a human body harvests more energy into fat storage rather than oxidation, is when we have obesity. The problem is not as simple as controlling energy intake and expenditure (calories), as the body is stuck in storage mode, where no matter how little energy is taken in, it is diverted into fat cells for storage. The big question is, what's causing our body to trigger a hormonal response where we store everything we eat? The answer may be carbohydrate intolerance. Everyone has a different carb tolerance. People who can tolerate more carbs have more food and dietary options and it doesn't affect them as adversely. People who naturally have the highest carb tolerance and remain thin or muscular are the ones the rest of us aspire to be. We eat like them to emulate them, not realizing the reason they can eat like that and we can't is because they naturally have a higher carb tolerance. Olympic strength coach Charles Poliquin also talks about not mimicking the diet of athletes. Their bodies can handle more carbs because of the strenuous activity they've been put under, they have more muscle, and their bodies are naturally more athletic. A regular person eats like this and it's a recipe for obesity. Olympic gold medalist Michael Phelps is known for an insane diet where he consumes a ridiculous amount of food. He has much higher demands, denser muscles, burns more energy, and has a much different tolerance for food than most people. If a muscular body builder tells you to eat more carbs, does this advice work for a regular person who occasionally hits the gym, but gains weight whenever they look at cake? Probably not. The one size fits all cookie cutter counting calorie and exercise method works for some people. As the food industry has figured out how to make food more refined while dropping calories, this methods no longer works for the general population. It's not an argument that calorie counting doesn't work, it's that it generally no longer works because the variables it was created under have changed. People have changed, the world has changed, and food has changed. Science is all about better truths and better methods. If a method stays the same as everything else is changing, it no longer remains science. Alchemy was once science until better chemistry came along. This presentation by Professor Jeff Volek discusses the physiologic effects of low carbohydrate diets with an emphasis on their unique effects on both features of metabolic syndrome and human performance. Sweden becomes first country to embrace high-fat low-carb as national guideline. In fact their heart health is only improving. The problem with the one size fits all approach that the US has used (Food Pyramid and calorie counting) that doesn't work for the majority of the population. People have different levels of carbohydrate tolerance. Humans evolved with a limited carbohydrate intake. 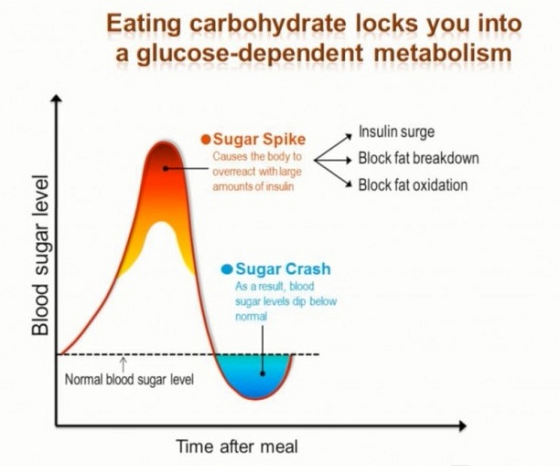 Insulin resistance = carbohydrate intolerance. Higher tolerance means more diet options. More people consistently lose more weight on low-cab vs low-fat. Glucose vs fat based metabolism: does your metabolism burn fat or glucose for energy? This is the key to burning fat and losing weight vs feeling tired and getting hungry. Low carb for optimal health and biomarkers. Fat oxidation of low-carb athletes is higher than normal elite athletes. Key to health and performance is understanding your own optimum macro levels. Dr. Jeff Volek is a Professor in the Department of Kinesiology at the University of Connecticut where he teaches and leads a research team that explores the physiologic impact of various dietary and exercise regimens and nutritional supplements. He has published 250 scientific manuscripts and presented over 100 talks at scientific and industry conferences in eight countries. He is the author of The Art and Science of Low Carbohydrate Living and The Art and Science of Low Carbohydrate Performance that delve deeper into the science and application of low carbohydrate diets.